As much as I wish this was not the case, my children have a very defined range of vegetables they like at their young ages. I continue to offer the ones they will eat, and continue to offer new vegetables to gauge their interest level. I am confident that their preferences will change over the years and slowly but surely their vegetable repertoire will be much more sophisticated. I’ll be patient and encouraging as their taste preferences grow. 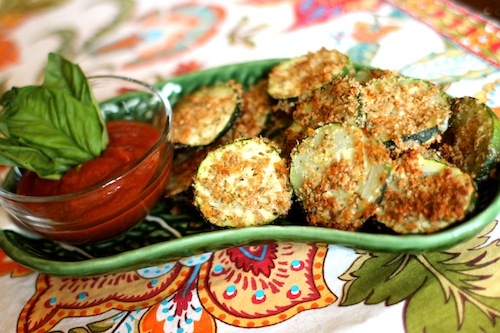 Preparing vegetables with a coating and dipping sauce sure helps the kid appeal and intrigue and that is what is done with this tasty zucchini coin recipe. This is a great recipe for children to help with and engaging them in the cooking and preparation process sure helps with buy-in! 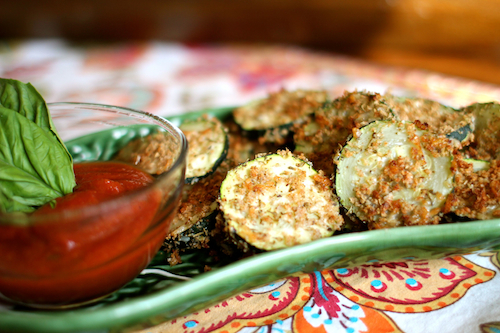 Preparing vegetables with a coating and dipping sauce sure helps the kid appeal and intrigue and that is what is done with this tasty zucchini coin recipe. Preheat oven to 425degrees F., and line a baking sheet with parchment paper. In a shallow bowl, mix together breadcrumbs, cheese and seasonings. Dip zucchini slices into egg whites and then dredge in breadcrumb mixture pressings the crumb mix into each coin to adhere. Place coated slices onto the prepared baking sheet. Bake until golden for 25 minutes, turning over halfway through baking time.